With this setting, the list of tables is restricted to the current schema. Enter the table or view that you're searching for here. The * symbol serves as a placeholder for any characters. 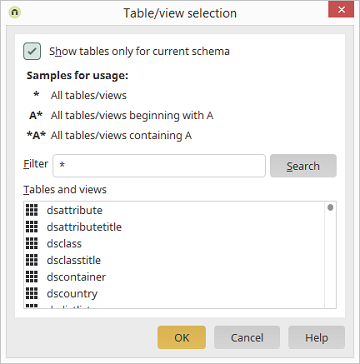 A* finds all tables or view whose names begins with A. *A* finds all tables or views whose name contains the letter A.
Click on this button to activate the filter. The search results are listed here. Select the table or view that you would like to use.